They didn't know that I used to be one of them. In all honesty, I was worse than they were. At least they have a place to call home, food on their table, a family to support them. I had none of that, and I think that's why I ended up losing my way. But at least now I can try to make up for it. I grew up in Neovia myself, my family struggling much like many of the others to make ends meet. Back then, the taxes weren't as great, and most families were able to pay both the taxes and the costs necessary to get a meal, however small it may be. My family, however, wasn't so lucky, and much like Sunil and his family experienced, we lost our home. The difference is that we never got ours back. That meant that I had to take to living to the streets to survive, and that also meant doing whatever I could to stay alive. To make sure I ate, I stole from the stores. To pay for my costs, I broke into houses and took some coins. And whenever I was in need of a new change of clothes, it was as easy as making off with the clothes that someone had hung outside to dry. I was a delinquent, one of the poor, destitute street rats who stole to survive. I had no other choice, and kept up my crimes to keep myself alive, no matter what the cost. The few times that I was noticed, pandemonium spread, and everyone who cared enough did all that they could to catch me, the thieving delinquent who was terrorizing the town. 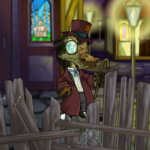 That's actually how I got to be known as Wild, as citizens were constantly on the lookout for the "wild, possibly homeless Krawk" who was plastered over wanted posters all over Neovia. As my pilfering allowed me to change costumes regularly, and I actually took the time to remain presentable and clean, no one ever took a second glance in my direction and recognized me to be the most wanted. They were all too busy trying to survive in the poverty that they couldn't be concerned with troublemakers. Eventually, I was able to find myself a position as the bookkeeper for the Mayor, and as I was accustomed to living on the streets and periods of near starvation, putting off purchasing food in order to save for shelter was not a difficult feat to accomplish; I stole almost every meal I needed and made sure not to be seen, as to not risk my job. Finally, I had enough saved to purchase myself a place to live, a rundown house at the outskirts of town, and although it wasn't much, it was a place that I could call home. It was around the time that the Mayor had decided to cut back on the staff working for him, and fired his tax collector, appointing me to take on his position as well as continue my own. I was working both jobs for no extra pay, which sounds horrible in retrospect, but at the time, I was excited to be going from homeless street rat to working overtime and having a place to live. What I didn't expect, though, was that I would change so much. It was my first exposure to money and status, the two things I never had growing up. Of course, I was never allowed to take the money for myself, but just being able to collect it and accumulate it throughout the day was enough for me. By the time the day ended, the velvet bag was bulging and clinking with coins, and I couldn't help but be reminded that it was more money than I had ever seen in my life. And the fact that I instilled the fear in those that I took the coins from, that they were actually afraid and submissively respectful of me, the street urchin who had, years before, resorted to stealing to survive... the feeling was incredible. Then, after the Mayor was turned into a Moquot by that swamp witch, I was free, free to do whatever I wanted. Our government essentially was left to continue on its own, as the people were responsible for electing a new mayor, and as they were too concerned with resuming their lives, it never occurred. I still collected the taxes, except with no supervision, I increased the amounts that were due, pocketing the difference and enhancing my own salary. I had gone from the simple tax collector to one of the wealthiest in Neovia, and there was no one who would stop me. Me, the street rat turned wealthy homeowner, the tax collector who could shatter someone's hopes and dreams with a simple knock on the door. I thought that I had it all, that my life was perfect, but all it took was one little defenseless, scared Shoyru to show me that I had lost my way. I was taking from these people when I used to be one of them, and all because I had let the allure of coin and power go to my head. But as Aesun had mentioned to his father, I was no longer bad, and I did not want to stray off of the new path that I found myself on. In following my path, I had found myself knocking on the door of Aesun's and Sunil's house once again. I waited for a few seconds until the door opened a crack, and Aesun's face peered out from behind the door. I grinned at the little Shoyru, who smiled back at me before calling into the house, "Daddy, Mr. Wild is here!" He opened the door to let me in, and once I was through the threshold, he quietly closed the door with a click. Sunil came out of the shadows of the hallway, looking even better than the last time I had seen him. The bags completely gone from under his eyes, he appeared to be back to full health. He greeted me with a handshake (the first time anyone had done so since I had taken this position) and invited me to take a seat at the table once more as Aesun retreated down the hall. "So what brings you back here again, after you sort of ran out last time you came to talk to us?" he inquired, as we both sat at the table. "I quit my position as the tax collector," I said, nodding my head in confirmation at his expression of shock. "I wanted you to be the first to know." "I can't do the job anymore. I've hurt too many people and caused too much damage to be able to continuing doing what I'm doing, especially when I know what it feels like to be where you are." I told him the story of my past, and how I had grown up like his family, fighting to stay afloat. I could tell that the fact that I turned against my own origins had disgusted Sunil, but out of respect or possibly belief that I had actually changed, he simply nodded solemnly. "I know what I did was wrong," I said, "and I guess I didn't want to remember where I came from. But if anything, that should have been something to keep me from turning the way that I did." "You were tempted by what you desired most and lost your way," Sunil shrugged. "Greed gets the better of all of us. You're at least starting to make up for it, so it'll all be made up for in the end." "Oh, I think I've made up for everything, actually." "What did you do?" he inquired. I grinned, and related how I had spent the past few days visiting each family who I was responsible for taxing, and returned the coins which I had collected from them over the years, supplemented with some of my own salary ("As my way of letting them know I was sorry," I added). I also told Sunil of how, with my resignation, there would be no more taxation until a new mayor was elected and he appointed someone else to take my place. As I was unsupervised in my work and completed it myself, no one would know that the taxes weren't being collected, which should allow the people enough time to get themselves on solid ground before the new round of taxing begins, if at all. "And speaking of taxing, I've let behind some instructions to the new tax collector, should there be one," I said. "Now everyone will be taxed based on their income, instead of at a fixed rate, which will leave everyone with enough gold to support themselves." "That's incredible!" Sunil said excitedly, smiling widely. "I'm sure everyone loved hearing that." The reactions from the people were incredible, I told him, and it felt more satisfying than anything I could have ever imagined. Some cried, but tears of happiness instead of fear, and some cheered, delighted at the end of their troubles. Some had even gone so far as to sweep me into hugs, something that I had literally never experienced in my lifetime. There was no animosity, no anger or hatred, just families rejoicing at the return of their funds and a promise of a brighter tomorrow. My image within Neovia had changed, even. No longer were citizens scared of me, the stigma whose presence caused people to withdraw out of loathing or fear. I was the anti-hero, the wayward savior of the poor of Neovia. I had caused pain and panic in my time as the collected, but had more than made up for my actions, granting the people a promise of a future where they could actually afford to survive in. I didn't expect for the popular opinion of me to change overnight, the mere fact that people weren't scurrying to get away from me was a sign that things had changed, and that I had finally done the right thing. "So I think everything is going to be okay, at least for a while," I said simply. "It won't be perfect," Sunil agreed, "but we'll manage. We definitely will, now that you're not taxing us of every last coin." We both laughed, before I remembered one last change that I had made. "Oh, I almost forgot! I added in a little something extra for your family, Sunil." "There's a special note in the books for you. If the taxes ever do start up again, you're exempt from paying. Consider it my extra apology to you." Sunil looked dumbfounded; his mouth fell open in shock and surprise. "How... why did you do that? Can you do that?" he stammered. "Well, what if you're too sick to ever work again? I have the power to exempt you." I smiled slyly, before turning to a serious expression. "In all honesty, I want Aesun to be taken care of. When I saw him in that alley, I couldn't help but be reminded of myself at his age. It would be selfish of me to force him to experience what I went through." "What did you go through, Mr. Wild?" Sunil and I turned to see Aesun standing a few feet from the table; in our conversation, neither one of us had seen him approach. I got out of my seat and walked up to him, and squatted down so that we were eye-to-eye before I spoke. "Aesun, I didn't have a home when I was your age, and didn't get one until I bought one for myself," I said. "Then a lot of stuff happened and I turned into a bad Krawk for a while, until you reminded me of where I came from. You remind me of a better me, a younger me who was still good, and I want you to live a life where you stay good. I want to make sure that happens, okay?" Aesun nodded, before saying quietly, "Mr. Wild, I don't think you were ever bad. I think you just couldn't see the light and you forgot what you really believed in." He stumbled forward and threw his arms around me, embracing me into a hug. I hesitated momentarily, before wrapping my arms around him and returning it. A single tear rolled down my cheek, and dropped onto his shoulder. "Thank you," I muttered, and he hugged me tighter. I turned down Sunil's offer to join his family for dinner, and asserted that I had to be on my way. As I stood on the front porch of his house and we exchanged parting sentiments, Sunil looked as if a sudden strike of inspiration had hit him. He asked, "Wait, if you quit your job, what are you going to do now?" I grinned uncomfortably; I had hoped to keep my plans a secret. "Well, I'm leaving," I revealed. "I've done too much, so I'm leaving Neovia." "But where will you go?" Aesun demanded. "I don't know," I shrugged, "but I think a fresh start is what will be the best for me now." I looked at Sunil, and we both nodded solemnly, as if we shared a mutual understanding of my desires. After all that I had done, I couldn't stay in Neovia. I could leave and move into a new town and start a new life, where I wasn't known as the tax collector gone good. I would be a normal Krawk, settling down to live a normal life, and that's all I would be. That's all I needed. Sunil, Aesun, and I exchanged our final goodbyes, and after Aesun insisted on giving me another hug, I was on my way, walking down the dirt road into the setting sun. This was going to be my new beginning, and this time, I was going to do everything right. "Mr. Wild!" Aesun called, and I turned to see him standing in the road, several yards away in front of his house. "You're a good Krawk now! It's what's in your heart!" I smiled warmly at him. "And you're a good kid; don't ever forget that." Good to be Al - SHH!